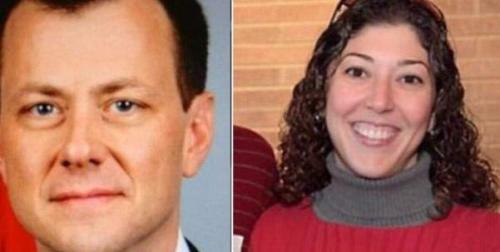 A previously unreleased text message exchange between disgraced FBI agents Peter Strzok and Lisa Page, who were removed from special counsel Robert Mueller's probe for bias, reveals perhaps the most direct evidence of both their feelings for Donald Trump and their intent to make sure he didn't make it to the White House. Note that the leaked conclusion from the IG report reads "We did not find documentary or testimonial evidence that improper considerations, including political bias, directly affected the specific investigative actions we reviewed," thanks to policies designed "protect the institutions from allegations of abuse, political interference, and biased enforcement of the law." "Now let's totally put on our FBI badges and be Boyscouts about the whole thing" we're sure came next. The conclusions from the long-anticipated report from the DOJ's Inspector General (OIG) were leaked to Bloomberg Thursday morning, which says that despite any personal animus the FBI employees had against Trump, that bias did not creep into their conduct. Even, apparently, when they changed the language of her "exoneration" letter through extensive edits which effectively decriminalized her behavior. Needless to say, the IG report - what we know of it, is starting to seem a lot like Comey laying out all of Hillary Clinton's alleged crimes in great detail, only to exonerate her by saying that "no reasonable prosecutor" would bring a case against the former Secretary of State.